Plot: Moana is the daughter of the chief on an isolated Pacific island, and is in training to become the next chief, but she feels drawn to the ocean. When a blight hits their island she sets out to find the demigod Maui to return the heart of an island goddess and restore the world. Unfortunately Maui is less a noble hero and more an ego-driven and arrogant nuisance. Review: Without a Thanksgiving Weekend to release Disney latest opus Down Under we’re waiting for Christmas to get it in cinemas. Thanks to a very generous special screening, we got an early look to coincide with the USA release, and were excited because Disney have been killing it lately. In a year of disappointing cinema, Disney have been a beacon of hope and entertainment, managing to bring their films into the modern world and address changing society expectations without feeling like they’ve forgotten their origins and reputation. To put some numbers on it, Disney had a record breaking year in 2015 earning almost six billion in box office. In 2016 they’d exceeded this record before the release of Doctor Strange, Moana and Star Wars: Rogue One. And between Zootopia, Finding Dory, Captain America: Civil War and Pete’s Dragon I don’t anyone feels they haven’t earned it. So when it comes to Moana we are completely thrilled that the Disney creative team still have more to show us. So, Moana. 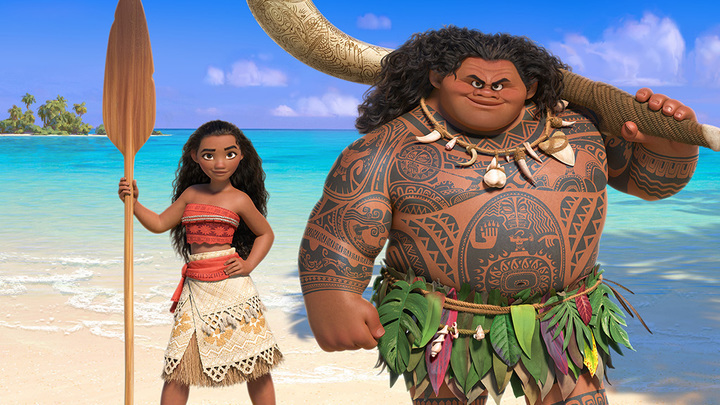 The film is seeped in Polynesian culture and mythology giving a new look that we haven’t seen from Disney before. It doesn’t cast an overly romanticised view of the culture, rather it’s presented as is, a part of everyday life for particular people at a particular time in history. The film-makers (the team behind The Little Mermaid, Aladdin, Great Mouse Detective and many other classics) spent five years developing the movie during which time they studied the culture in Fiji, Samoa and Tahiti. The movie and the story feels genuine, every aspect of the style and animation looking like years of work went into it. The blending of CGI and hand-drawn animation for Maui’s tattoos looks fantastic. While we’re on the subject of animation – it is amazing. You might think that CGI would have lost the ability to stun through over-exposure but this is definitely a film that has to be seen to be believed. The water animation alone is incredible in it’s detail, there must have been thousands of hours spent creating the ocean and the way it moves and shift in colour. We also love our leading character. 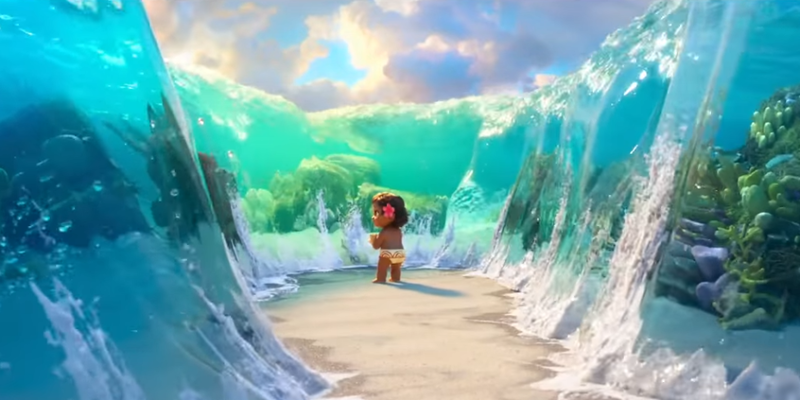 Moana is in some ways the archetypical Disney leading lady (something Maui actually comments on), dreaming of another world and feeling like there’s something out there waiting for her. She’s like Judy Hopps before her, and like Judy in Zootopia she also appeals to the modern audience values. She’s a leader, she’s brave and she doesn’t want to compromise when it comes to doing the right thing. She’s also the first of the traditional Disney Princess characters without any hint of a love interest, or even a romantic subplot. 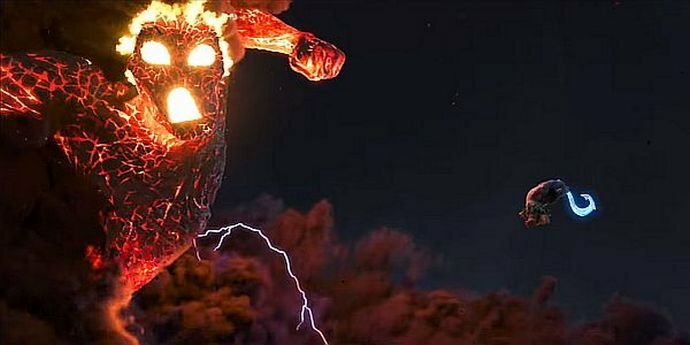 Although demigod Maui is a lot of fun, and his tattoos get some of the best comic relief (along with the demented chicken), this is Moana’s show. What holds the movie back is a pretty severe case of 2nd act slump. In between leaving her village and confronting the awesome lava giant the movie meanders around, running up one detour after another. Pirates, giant crabs and long arguments slow the momentum down, with the weaker song numbers taking place during these sequences. Super strong first and third acts, bridged by a slow middle. That said, the Mad Max: Fury Road influenced attack by the Kakamora is a visual feast and features wonderful choreography. For us, Zootopia is the best Disney animated film we’ve had this year – one of the best they’ve produced. But we wouldn’t turn our noses up at Moana. I’m looking forward to taking my 4 year old daughter to see it, because she’s going to love Moana herself.